This is meant to be a tramping club trip, though really it’s just Éamonn and me. We’re the “social” trip, but I think people bailed on the social idea when it became clearer that we’d be pack-horses for everyone else who’s converging on Totara Flats from various directions. Between us we’ve decided the most “social” way of getting to Totara Flats will be up to Powell and over High Ridge. I’ve decided my hobby on this trip will be collecting Department of Conservation Asset Numbers. Asset number bagging is set to be the next big thing once everyone’s gotten bored of hut bagging, and I figure I’m getting a head-start on the crowd. 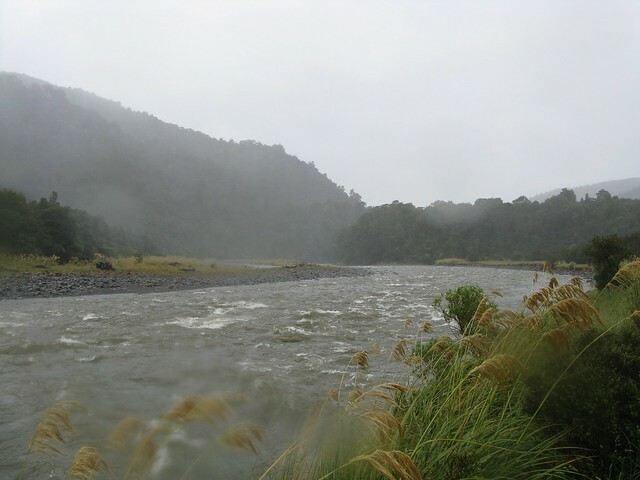 Huts visited: Holdsworth Lodge (0 nights), Mountain House Shelter (0 nights), Powell Hut (1 night), Totara Flats Hut (1 night), Sayers Hut (0 nights). Intended route: Walk to Powell Hut on Friday night, then over High Ridge to Totara Flats for Saturday night, then back out to Holdsworth Road. Actual route: Powell Hut on Friday night, but to Totara Flats via the more direct route. 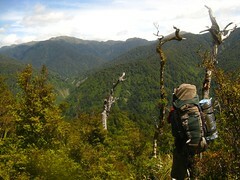 Over the Waiohine to Sayers Hut on Sunday, the up to spot-height 772 and along ridge to the north past 768, and eventually back to the track above Totara Creek. 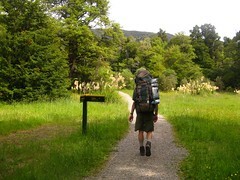 Then out to Holdsworth Road via Pig Flat, and down to the Atiwhakatu Track. Friday, 8pm: We’ve arrived at the Holdsworth road-end, the weather’s not too flash. Best to get going. 8.55pm: It’s not quite raining yet, but a strong nor-westerly is blowing. I’ve just been nearly blown off my feet near the Rocky Lookout. Not at the lookout, but on the track below it. The wind just came screaming alongside the ridge out of nowhere. It’s eerie and discomforting. 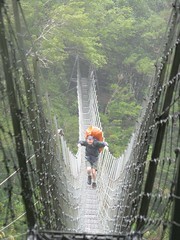 This’ll be bad for Steve and Richard, who were planning to walk and swim down the Waiohine Gorge. 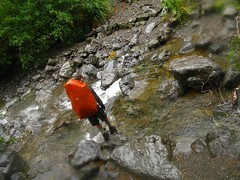 We’ve checked the book and they signed in at Holdsworth Lodge earlier today, headed straight for Waiohine Forks. We’ll be okay for ourselves, by comparison. I have the rain all sussed since I bought myself a brand new tramping umbrella earlier today. It’s in my pack, and may just prove to be the best $14.99 I’ve ever spent. 9.15pm: We’re at the junction where we could go straight to Totara Flats if we wanted. Not for us, though. We’re from the social group. 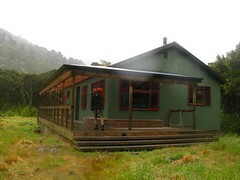 And the most “social” place in the Tararuas is Powell Hut. 9.30pm: Crud, I just realised I’ve been forgetting to get the asset numbers. We just passed DoC Asset Number 066132  and DoC Asset Number 066126  on Pig Flat. It’s getting dark. 9.33pm: Éamonn’s walking in the dark quite confidently. 9.35pm: DoC Asset Number 009457  — we could probably bed down and sleep in here if we wanted to. We’re not strictly allowed to, though, so it’d be very anti-social. On and up? 9.42pm: Actually his torch just isn’t working properly, so maybe he’s not been walking in the dark by choice. It keeps flicking off, and he’s just told me he’s having to hold a wire in place, which is tricky and unreliable thanks to the rain. 9.56pm: Slippery slowly sliding in the dark. Very slowly. 10.12pm: Somewhere we went through the tree line and are now in the open. I didn’t even notice, too busy staring at the ground ahead. The torch doesn’t shine far through the clag. There’s misty rain all around us. Éamonn’s stumbling behind or in front of me in the dark at various intervals. 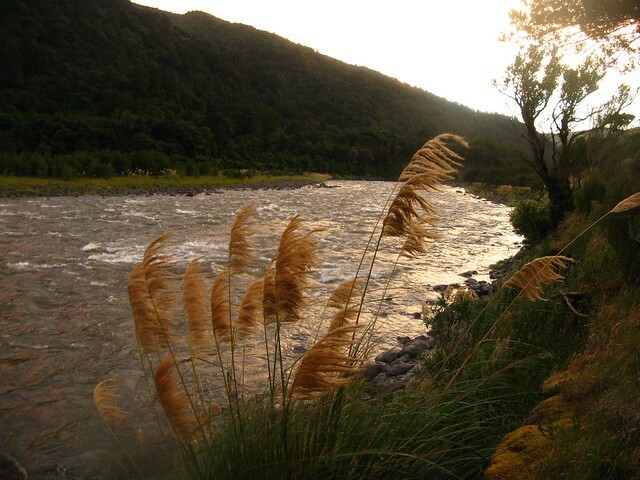 We’re getting concerned about the guys planning to float and swim down the Waiohine Gorge tomorrow, and have even just considered an idea to get over Holdsworth and down to Waiohine Forks and catch them before they leave in the morning. Éamonn’s especially concerned as he did the same thing a year ago and knows how perfect the weather needs to be. It’s probably not realistic, though, and we’ve resolved that Richard and Steve both have their heads screwed on enough to not do anything silly. 10.21pm: Yahoo! We’ve reached DoC Asset Number 007973 . There are a couple of people here who arrived about an hour ago, and they’re just starting to sort themselves ready for bed. I’m dragging a mattress further over to the kitchen area so as to be less bother while I’m settling down. Apparently whoever came through here before these two people left one of the in-hut gas burners running, and lit. That’s quite bad. 10.25pm: I picked up Éamonn’s pack. It’s very heavy. Maybe I should have asked about taking some of the shopping. Anyway, settling down to sleep on the floor. Saturday, 2.12am: The rain and especially wind are making a racket outside. Powell Hut seems partly sheltered from nor-westerlies, but every so often a big gust skirts around Holdsworth and hammers it. 7.37am: Lying on my mattress on the floor. Not much motivation to get up, but I guess I should. Every so often another nor-westerly gust comes through and makes the hut shake. The rain’s not a problem, not with the umbrella, but I’m not so sure about the wind. I think Éamonn’s feeling the same. 8.16am: Okay, let’s state clearly that DoC hasn’t stapled asset numbers to the toilets. Clearly DoC’s Wairarapa Conservancy isn’t as efficient as the Palmerston North Conservancy was in the Ruahines a couple of weeks ago. They had asset numbers nailed to all the long drops. 8.30am: I’ve had some form of breakfast. We’re divvying up the weight properly now that it’s all down-hill. Éamonn’s handed me about 6 packets of biscuits, 500 grams of dry pasta, a tin of tuna (in oil), at least one block of chocolate, and a 600 gram fruit-cake. He didn’t give me the litre of milk he’s been carrying. Somewhere in there he has another 600 grams of dry pasta, and about as many packets of biscuits and chocolate again. 8.58am: This is bad news. We went for a scurry up the hill towards Holdsworth, and the support frame for my brand new umbrella has been torn apart. Éamonn snapped this sequence of the critical moments. I think the umbrella may have become a fraction of a gram lighter as part of its soul was violently whipped away by the nor-westerly. I suspect an umbrella’s soul could be manifested within those metallic hooks that hold the brackety bits together. That decided it, really. 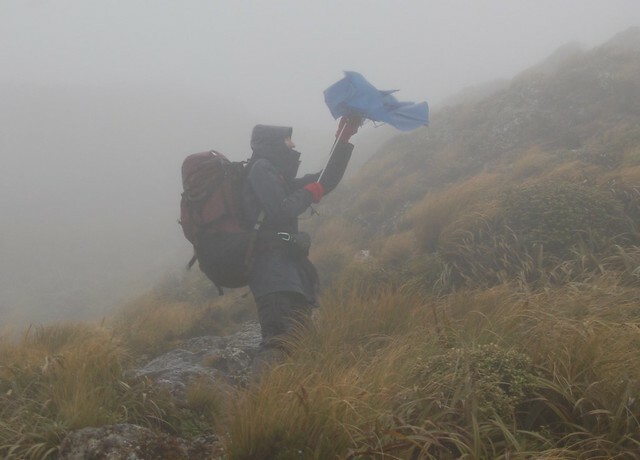 We’re not going over High Ridge — the umbrella’s just been trashed by wind, and I don’t want to risk getting wet. Down to Totara Flats by the direct route it is. Those two other people are wandering around, but in no rush to get going along the tops to Jumbo. They’re thinking of waiting for the wind to die down a lot. 8.59am: Hmph. Don’t buy your tramping gear from Farmers, it’s not well made. I hope I don’t get rained on too much from here. 9.06am: Leaving, all down-hill from here. Next stop Totara Flats. I’ve stuffed the mess into the top of my pack for now, and will look to see if it can be mended later. 9.21am: Stopping to remove some of this storm gear, which went on in case we ended up going the High Ridge way. Now that we’re heading straight down under trees, things are getting very hot in here. 9.42am: DoC Asset Number 009457  again. It’s much quicker getting down that slope than up it. Daylight helped, including not having to rely on a broken torch. 10.06am: DoC Asset Number 066416 , which I forgot to note the number of last night. Down down down to Totara Creek from here! Éamonn reckons my umbrella’s been “Holdsworthed”. I concur. 10.20am: We’ve been chatting about phrases we dislike, and phrases Éamonn’s noticed since he shifted here from Ireland. He dislikes the term “fronting up” that’s used all over the media here, pointing out that it’s needlessly confrontational. I’m sick of “not a good look”, which someone recently dreamed up and now it’s everywhere. Other silly media terms are “going forward” (which adds nothing to a sentence), though I’ve not heard of any “brain explosions” lately. I think they went out of fashion on the TV news so they’ve died out everywhere else. 10.44am: We’re at the crossing point for Totara Creek. Still raining, but the creek isn’t flooded. Éamonn’s wondering what “Totara” looks like, so I tell him I’ll point it out when I see it. 11.15am: Still no Totara. Have I missed something? 11.40am: I’ve been trying to count side creeks in major and minor numbers. I got to about 3.2 or 3.3, which I think is about right though it’s always difficult to correlate this kind of thing with a map. Probably not far to go now. 12.02pm: it’s still a fun amusement ride over DoC Asset Number 009605 . It’s not as exciting as it was a few years ago , though, because DoC has since attached additional support cables. Looking off the side as the asset is being hammered by the wind, I think it’s reasonable to say that Steve and Richard would be screwed if they tried to swim and float down the Waiohine Gorge today. It’s running fast and definitely flooded. Hopefully they’ve pulled out and done something else. Maybe we’ll see them tonight if they come back to here, but I think if I were them I wouldn’t bother, and would just laze around at somewhere like Powell. 12.04pm: There’s a cluster of asset numbers here, namely DoC Asset Number 066209  which seems redundant, DoC Asset Number 066319 , and DoC Asset Number 066312  which really only communicates information about DoC Asset Number 009605  similar to what was on the other end. DoC Asset Number 009460 . 12.07pm: Hurrah, DoC Asset Number 009460 , and our destination for tonight. I’m quite happy to stop here. A couple of people are here, but they’re just packing up preparing to leave. It must still be early in the day. Éamonn and I are claiming a couple of spaces. My favourite bunk here is the top bunk that looks out over the river, and I’ve nabbed it. This is my third time here and I’ve still never seen the Waiohine River out of flood. 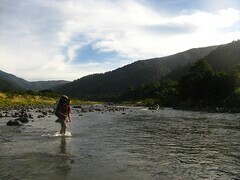 I think it’s one of my favourite rivers in the Tararuas. Lunch time! I’m leaving my damp clothes on for now, because I want to go out for a walk around the flats soon while it’s still light. 1.00pm: I think I might be able to salvage something from this umbrella. Looking more closely, it’s really only about 3 spokes that are bent and broken. The rest will blend into shape, but maybe a bit lop-sided. I smell a warranty claim — there’s no way they can possibly put this one down to “normal wear and tear”. 1.13pm: Ray’s shown up with another tramping club group. They’ve walked in from Walls Whare. 1.21pm: Time for a look out on the flats, more or less back the way that Ray’s just come from. DoC doesn’t have asset numbers on the toilets here, either. Fortunately the desperate can still identify which structures are the long-drop toilets by following the directions of the nearby DoC Asset Number 066440 . It’s a clunky and imprecise system, though. I might need to write in to let them know, since they’ll never be maintained by the department if it’s not on the official record that they exist. Perhaps that’s why there are two of them. I bet the second one was dropped in because someone looked at DoC’s asset database and believed there was no toilet here. It’s probably a matter of weeks before a third shows up. DoC Asset Number 066441  seems redundant for a similar reason to DoC Asset Number 066209  which we saw earlier. It’s just sitting there with no clear purpose, taking up valuable space in DoC’s asset database. Weird. 1.27pm: The umbrella’s up now, and just as well because it’s still lightly raining. It’s lop-sided, but at least partly working. It might help if I can hook the hookey things into the hook-holder holes to get it to hold more happily. 2.00pm: As usual, Totara Flats is damp and muted, which is nice. We’ve walked out to the river’s edge about opposite where Sayers Hut should be, but can’t see it. It’s buried in the trees somewhere. Éamonn’s been trying to pick out places on the flats where we could have games and competitions tomorrow if it clears up. Maybe we’ll start heading back now. Totara Flats. Another of Éamonn’s photos. The flooded Waiohine, though not as flooded as I’ve seen it at times. 2.29pm: I’m not convinced about this umbrella. I have to keep holding up the edge, and now the shaft bit has fallen off. Bad construction. 2.38pm: Okay, we’ve arrived back and this hut is much more full. Anna’s shown up with another tramping club group, and everyone but us has clambered into the other room (the boring room). Meanwhile some people doing a Duke of Edinburgh qualification have shown up, and Anna’s already said Éamonn and I will shift out. I really wanted that bunk. Oh well. 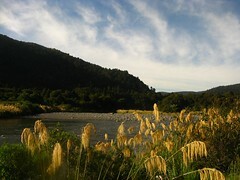 Anna also brought news that Steve and Richard had given up on their bid to get down the Waiohine Gorge, and had signed out of the book at Holdsworth Lodge, so we’ll not be seeing them here. Everyone’s started getting into the biscuits and chocolate we bought, which is good because I didn’t fancy carrying it out. the extra supports were added. 3.45pm: I think I might go and play on DoC Asset Number 009605  again. I’m dragging Éamonn with me so I can get photos of him struggling against being thrown off by the wind. 4.12pm: For some reason the bridge sways a lot when I’m on it, but not when Éamonn’s on it. I can only guess he weighs so much that the gale coming through the gorge can’t shift him. It’s very frustrating when I’m trying to get a photo of him in trouble. 5.30pm: Dinner time. We’re dividing up our 1.1kg of dry pasta, taking 150g each, leaving 800g in case of dire emergency. Éamonn’s recipe idea is to mix it with tuna (in oil), chuck in some soup mix for flavour and a whole lot of dehydrated peas, and bam! Others in the room think they’re mocking us, but they’re really affirming their jealousy. 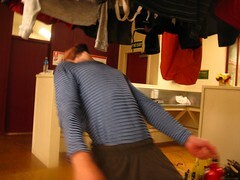 Éamonn suggests a limbo competition. 5.31pm: Nevertheless, I think the likeliness we’ll need 800g of pasta during the rest of the weekend are indeed low. 7.20pm: I don’t know why I’m wasting my life sitting in the bunk room. 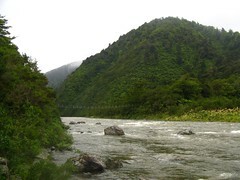 I think I might instead go outside and sit next to the river, so hop down to the point beyond DoC Asset Number 066204 . It’s still flooded, but visibly going down very slowly. 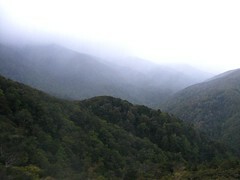 The Waiohine, just below the hut. 8.00pm: Ray’s pointed out that there’s an old track that bypasses Totara Flats Hut, dating from before this hut was moved here a few years back. Suddenly DoC Asset Number 066209  and DoC Asset Number 066441  don’t seem as redundant any more, as they’re making sure people know where the hut is without accidentally stumbling onto the old track. I’ve just pushed through a few trees and it’s still very visible. There’s still an orange triangle on it, in fact. 8.54pm: Well I’ve ditched everyone for a while and gone for another short walk. 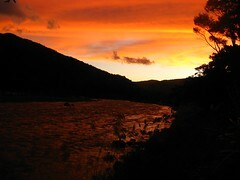 It’s a nice sunset over Totara Flats and the declining Waiohine River, that’s for sure. 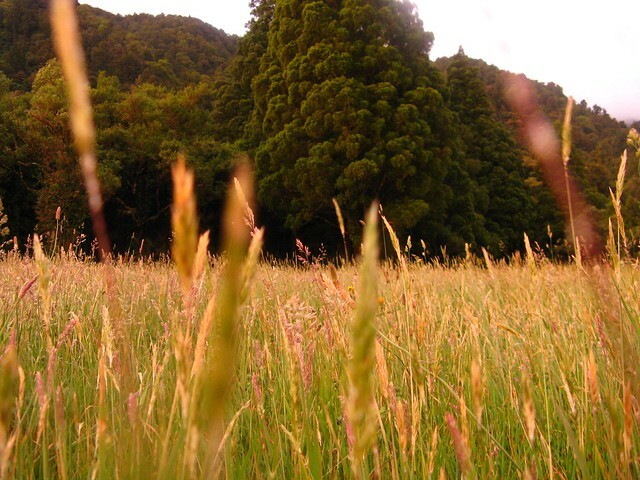 This is one of my favourite parts of the Tararuas. 9.10pm: Nearly everyone’s gone to bed now that I’m back. This is amazing, it’s not even dark yet! Maybe Éamonn’s not the only person here with a broken torch. Heh heh. I don’t think I want to scrunch into that bunk room, so I’ve dragged a mattress out into the kitchen area. Éamonn’s going one further and sleeping out on the deck. It still sounds a bit windy out there for me. Sunday, 5.40am: I was nicely asleep on the kitchen floor, and Éamonn’s woken me with his incessant water boiling. I think I’m going to have to get up now, simply because one person up and about usually means more will follow, and then everyone’s going to want to tread on my head when they boil more water. This is all because of unnecessary cooking gas in the huts. I knew it would wreck my sleep one day! Éamonn had a good night outside, and it calmed down, but sadly there were many possums around. We probably won’t bother with games on the flats, we’d rather get going. 6.09am: I slip into the crowded bunk room and sneak out with my pack, which should let me get myself sorted and do some packing out in the main room. 6.22am: So, the plan is that since it’s just Éamonn and me and the river’s gone down, we’ll make the route out more interesting, and hop over to Sayers Hut for a look. Then head up along the ridge north of spot-height 772. 7.05am: As some poor sod has left a collection of rubbish at the hut, mostly wine bottles, we’ve decided that we (meaning mostly Éamonn) will pack a heap of empty wine bottles (far too many to justify them as candle holders) and carry them out. 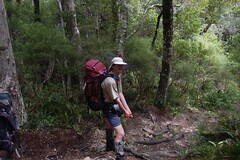 7.32am: On to Sayers Hut, via Totara Flats. 7.41am: My pack feels suspiciously light, perhaps because of all the food we dished out. Éamonn gave away his bottle of milk this morning! I truly didn’t see that one coming. He’s said he hopes they actually drink it. 7.51am: The easiest way to pin-point where Sayers Hut should be is to stand in line with the old (pre-2006) Totara Flats Hut location on the flats, and take a bearing directly south across the river. It’s probably about 700 metres in that direction. Most maps either show the current hut or the old (pre 2006) hut that was removed having been supposed to be flood-prone. Interestingly the map on the wall inside the current hut plays things safe by stating there was a hut in both locations, but there isn’t. 8.03am: Crossing in the most obvious place where the river’s wide and the current’s slow, after a quick scout further down. It’s only knee deep, which is grand. 8.06am: There’s an obvious cairn on this side, and another obvious cairn further down. We’ll follow the cairns. 8.16am: Okay, bad idea. There’s obviously not a hut down here. A honking female paradise duck just flew around us, but there’s no sign of a mate hanging around. I’m not used to hearing one but not the other. Back to the cairns. Maybe we should have simply gone up the bank between the two cairns rather than following them along the river bank. 8.33am: Sayers Hut is awesome. I have to call it by name, because DoC doesn’t seem to have stamped an asset number on this one. For reference, anyone planning a weekend of intensive DoC asset number bagging would be better served to avoid this entire side of the river. DoC would probably have cream pies thrown at them by the NZ Deerstalkers Association if they stamped a number on this hut. It’s pretty cool. Nobody’s written in the book for a couple of weeks, which doesn’t necessarily mean there were no visitors, of course. It’s a good thing the open long drop has so many spiders’ webs over the door; keeps the flies out. 8.43am: Time to go. Checking out the map, we’ll pretty much climb East from here until the track veers north for a distance, and then we don’t want to go down much at all because at spot-height 772 we’re leaving the main track to head north along the ridge. 8.56am: On a hunting topic, Éamonn and I got talking about hunting incidents, and in particular why I think the recent case with a tramper being shot by spotlighting idiots from the back of a truck in the Kaimanawas  is distinctly different from many other incidents related to hunting. It’s just one of the many random sorts of discussions people have out in the hills. 9.20am: Lots of Totara up here, which is a change from Totara Flats and the length along Totara Creek where there were no obvious ones. 9.28am: Éamonn found a feather, and he’s planning to keep it. 10.13am: Up a tree, and we’ve confirmed the presence of a lengthy ridge towards the north for us to walk down. 10.21am: We’re at spot-height 772. Aside from the whole track-changing-direction and suddenly-going-downwards thing, it’s clearly marked by several tape markers of various colours, and (presently) a giant warning sign about the current 1080 poison drop to get the possums. 10.34am: There’s a nice ground-trail along here. 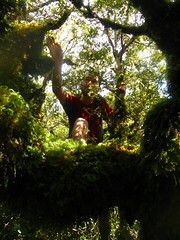 Totara hurts sometimes when you push through it. The leaves are quite sharp. 11.02am: We think we’ve just hit spot-height 768. There’s a giant white arrow improvised out of rectangular white markers that someone’s nailed onto a tree, and it’s heavily marked down to the western side of the ridge. I went on a quick scout, and it’s clearly leaving the ridge so that’s not the way we really want to go. A quick check of the map showed the spur going down to DoC Asset Number 009605 . Thinking back to yesterday, Ray mentioned there’s an old track heading up to here from there, not at all surprising in the Tararuas. 11.05am: We just pushed through a north-ward bearing for a while, and we’re back on a ground trail. 11.32am: There’s an uncharacteristically open bit of the ridge up here. 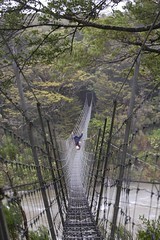 A great view down to the Waiohine Gorge. 12.11pm: Time to check the GPS is reading accurately. By my reckoning from map and compass, I’ve determined that we’re standing at 1804295E 5466691N — and yes, the GPS is almost exactly correct! 12.37pm: Éamonn’s keen to talk about the ethics of running over possums on New Zealand roads, and how it’s bad driving to line them up and run them over. He’s probably right. 1.03pm: The ridge is getting messy around here, with lots of false ground-trails. Best to just go on a bearing, perhaps. 1.10pm: I’ve told Éamonn he can go in front, as long as he picks a route suitable for a tramping club social grade trip. Éamonn’s started looking for a way to call a helicopter. 1.44pm: Free! We’ve reached the end of the ever-descending spur, and have stumbled onto a giant wide track-like thing above Totara Creek. Another triumph for off-track navigation adequacy over the New Zealand back-country. There’s a faint marker painted on a tree at the point where we came out. I doubt I’d have noticed it if I hadn’t realise there was a route behind there somewhere. 1.46pm: Lunch time! Some how we’ve gotten into a perverse discussion about the potential for New Zealand Gaiter Magazine, complete with centrefolds. There are very few tramping magazines out there. If only New Zealand Gaiter existed, we’d have something to leave in all the huts as an answer to the three hundred different hunting magazines of various titles. 1.55pm: Time to go, back towards Holdsworth. We don’t really want to go down the Gentle Annie track. Down from Pig Flat looks more direct on the map, so I guess we’ll find out. Back in the land of the Department of Conservation, I guess we should start expecting to see asset numbers again. 2.25pm: We’ve just reached DoC Asset Number 066416 , and met a very un-talkative chap (maybe Canadian from the accent of the 2 words he uttered before ignoring us), coming up from Holdsworth Road and heading down towards Totara Flats. 2.35pm: Pig Flat again. Unexpectedly, this is the third time we’ve walked this stretch of boardwalk on the weekend. It’s all turned into a bizarre figure eight pattern. 2.43pm: DoC Asset Number 068174 , just below DoC Asset Number 066126  — it’s a shame it doesn’t include time estimates. Not that they’d be accurate, but it’d indicate which way was faster. 2.48pm: And once again we’re at DoC Asset Number 066126 , finally actually heading down towards the Atiwhakatu Valley. Straight down the spur on a marked track. Zooooom! 2.56pm: Suddenly I’m kicking myself because I think I know why my pack felt suspiciously light. I’m fairly sure I left my raincoat and a fleece hanging up in the crowded bunk room when I was sneaking my stuff out this morning. There’s not a lot I can do about it now, hopefully someone will realise and grab them. 3.19pm: DoC Asset Number 086742  marks the lower end of the spur. Disturbingly it thinks we’re 2 hours from the Holdsworth Roadend, which Éamonn and I are having trouble believing. 3.59pm: We must be getting towards Holdsworth Road now, because the tracks are starting to get more spaghetti-like. Actually it’s Donnelly Flats. In 20 minutes we’ve bagged DoC Asset Number 086717 , DoC Asset Number 086748 , DoC Asset Number 086749  and DoC Asset Number 068784 . 4.03pm: We’re finally crossing DoC Asset Number 009402 . Éamonn’s having a chat with a guy from the nearby Masterton Tramping Club. I’m going to get some water. 4.07pm: I noticed the recycling bins behind Holdsworth Lodge, so we’re making use of them to dispose of the collection of wine bottles we’ve ended up carrying out. It’s a shame some people won’t bring out their own junk, which just means other people have to! Regrettably it’s unclear if Holdsworth Lodge actually has a DoC asset number. It’s kept locked since it’s been renovated, so I can’t get inside to see if there’s a tag nailed above the door. Perhaps some other day. 4.20pm: As a side thing, a couple of further assets at Holdsworth Road that I forgot to note on Friday night are DoC Asset Number 068320  and DoC Asset Number 085090 . It’s probably time to get changed in DoC Asset Number 009403  and go home. We bagged 25 distinct Department of Conservation Asset Numbers, not bad for a weekend, I don’t think. It’s time to go, and we drive away. Regrettably this is likely to be my last time out in New Zealand’s back-country for a while, but I hope to be back sooner or later. I think I need to find the receipt for that umbrella, it may prove to have been the worst $14.99 I’ve ever spent. As I sit behind the steering wheel, I’m wearing my “Possums are New Zealand’s little speed bumps” t-shirt. Éamonn neglects to comment, and buys me a pie. Totara Flats on Saturday night. Thanks Éamonn, t’was a fun weekend. Thanks also to Ray and Anna for respectively bringing out my raincoat and my fleece thingee. DoC Asset 066132: DoC sign on Pig Flat, directing to Mountain House, Powell Hut, Holdsworth Car Park and Totara Flats. DoC Asset 066126: DoC sign on Pig Flat, pointing to Atiwhakatu Valley. DoC Asset 009457: Mountain House Shelter. DoC Asset 007973: Powell Hut. DoC Asset 066416: DoC sign at three way junction turn-off point towards Totara Flats. 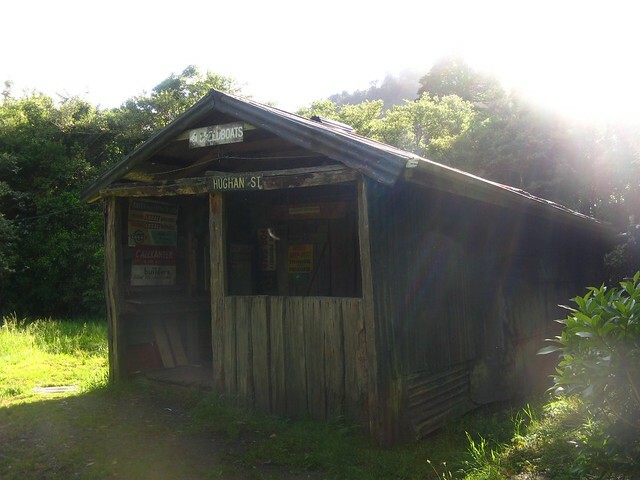 DoC Asset 009460: Totara Flats Hut. DoC Asset 066440: DoC signpost at the junction between the Totara Flats Hut and the two long-drop toilets. DoC Asset 066441: DoC signpost 50 metres from Totara Flats Hut, pointing along the track and saying “Hut”. DoC Asset 009605: Totara Flats Bridge. 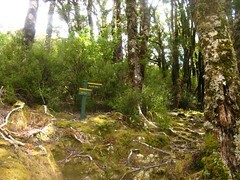 DoC Asset 066204: DoC signpost outside Totara Flats Hut, pointing directly down to the river-bank via a direct route. 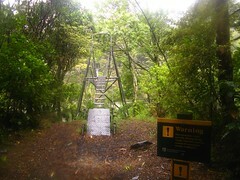 DoC Asset 066209: DoC signpost 50 metres from Totara Flats Hut, pointing one direction along the track and saying “Hut”, and direct to the nearby bridge saying “Bridge”. DoC Asset 066319: DoC signpost on the Totara Flats sign of the bridge, directing people to various nearby road-ends and other points of interest. DoC Asset 068174: DoC signpost just below Pig Flat, pointing one direction to Roadend “via Atiwhakatu Track”, and the other direction to Roadend “via Gentle Annie Track”. DoC Asset 068796: DoC signpost at the location of the original Mountain House Hut, pointing towards Mountain House Shelter and towards Powell Hut. DoC Asset 086742: DoC signpost on the Atiwhakatu Track at the lower end of the spur leading up to Pig Flat and Mountain House Shelter. DoC Asset 086717: DoC signpost at the junction on the north end of Donnelly Flats, indicating an alternative loop track. DoC Asset 086748: DoC signpost in Donnelly Flats, indicating the location of a nearby toilet. DoC Asset 086749: DoC signpost at the south end of Donnelly Flats, indicating 15 minutes to the carpark. DoC Asset 068784: A big sign near the entrance from Holdsworth Road, indicating estimated times for a variety of nearby locations and tracks. DoC Asset 009402: The bridge over the Atiwhakatu Stream at the Holdsworth road-end. DoC Asset 068320: A big sign with a basic map, near the Holdsworth carpark. DoC Asset 085090: A sign about didymo, with a bracket holding cleaning detergent bottles (all of which are empty). DoC Asset 009403: Shelter and toilet block next to Holdsworth carpark. 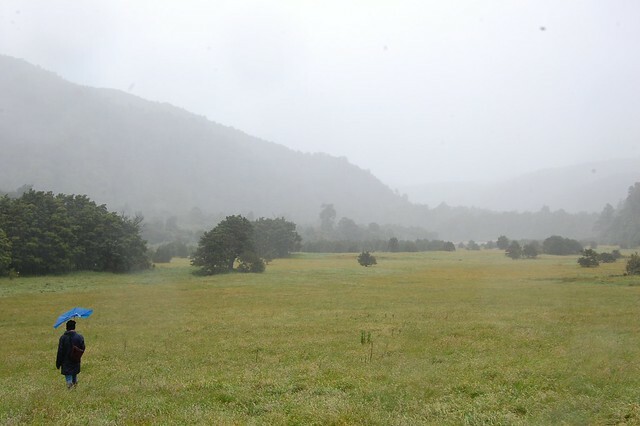 2 Comments To "Trip: Powell, Totara Flats and Sayers"
Good story -always thought hut baggers were a nerdy variety but you’ve opened up a new can of worms. And next time – go for the $16.99 umbrellas – they’re much better! I was thinking the ones with the hooks on the bottom might be more sturdy, but they were twice the price! I mean, could understand if the one I bought only lasted twenty years instead of fifty before requiring some servicing. But utterly trashed after its first outing?? ?